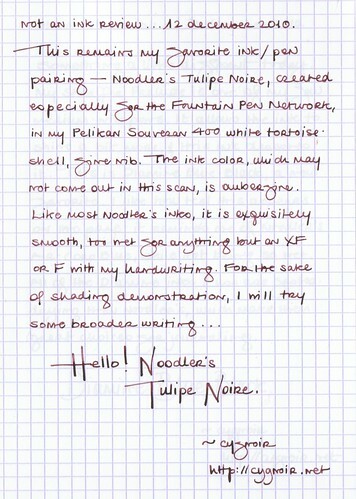 Not an ink test: Noodler’s FPN Dumas Tulipe Noire. I am digging these ink tests, and not only because they provide me with content on the days I don’t feel like writing about anything very personal. Sometimes the ink test research helps me discover other inks I must have! As I was looking for the proper title for this ink, I discovered Noodler’s Black Swan in Australian Roses, which appeals to me on so many levels. Materials used: Noodler’s FPN Dumas Tulipe Noire ink, Clairefontaine grid spiral notebook (14.8 x 21cm), Pelikan Souveran M 400 white tortoiseshell fountain pen. Next ›Not an ink test: Diamine Blue-Black. Oooh, I like this very much! Still looking for a good deep purply ink — I tried the PR Ebony Purple on your recommendation and loved the color, but to my shock, it clogged one of my wettest writers to the point that it wasn't just skipping, it wasn't writing at all. At this point, I'm writing off (oh ha ha) PR entirely. Maybe Noodler's will be worth my affections.